I’ve been a city girl most of my life and don’t know as much about plants and animals as I should. When we went to Brazil in 1988 we spent our first six years in the mega-city of Sao Paulo, which did little to add to my knowledge of nature. But all of that changed when we moved to West Central Brazil in 2002. Although we lived in the city of Cuiabá, we were just south of the world’s largest wetlands. This area, called the Pantanal, is home to hundreds of exotic plants and wild creatures. You’d have to be blind, deaf and dumb in order to ignore this gorgeous panoply of God’s creation. Slowly, I began to learn the names of different plants and animals. One of my favorite trees was the Mimosa. Its feathery, hot pink flowers are eye-catching, to say the least. 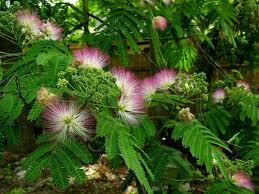 I always felt proud when I saw a Mimosa tree because I could easily identify it. Last month I was staying with friends in Elyria, Ohio and took a walk in their neighborhood. I stopped short when I saw a Mimosa tree growing in someone’s yard. I literally stopped walking and circled the tree a number of times to be sure my eyes were not deceiving me. Last weekend Dan and I went to Illinois to visit his brother, Paul. What a surprise to see a Mimosa tree growing in their yard! I have felt somewhat displaced because of our prolonged absence from Brazil. The Lord seems to be telling me that even though I may feel like a tropical plant in a forest of deciduous trees, I can keep thriving and growing wherever He puts me. I’m thankful for such a beautiful reminder! What a lovely devotion Hope!